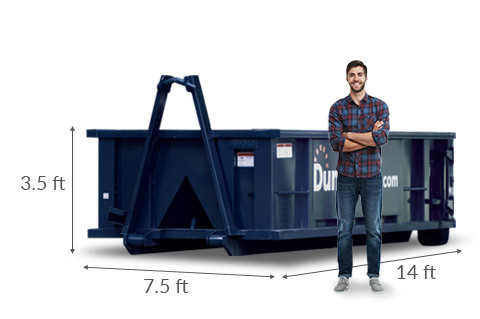 The typical dimensions of a 10 yard dumpster are 14 feet long, 7.5 feet wide and 3.5 feet high. It can hold up to 10 cubic yards of debris in volume, which is about 50-60 13-gallon trash bags. A 10 yard dumpster typically has a 2-3 ton (4,000-6,000 pound) weight limit. Disposal costs for this weight of debris are included in our flat-rate price. Keep in mind, a kitchen sink can weigh between 50-100 pounds, so be aware that the weight of your debris adds up fast. What Does a 10 Yard Dumpster Cost? The cost of a 10 yard dumpster rental averages about $222-$589. Our rates are all-inclusive, covering delivery, pickup, taxes and disposal up to your container’s weight limit. But keep in mind that exact pricing for a 10 yard container will depend on your location and the type of debris you’re throwing out. 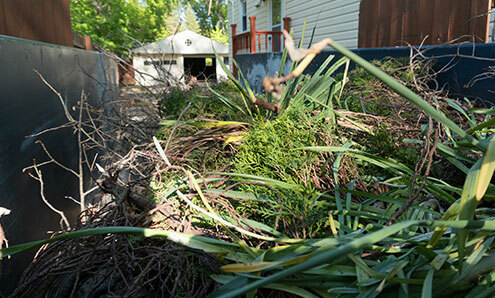 When you’re working on a small-scale project that leaves too much debris for the curb, a 10 yard container is a great option for waste removal. If you need more information, check out the video or give us a call at 844-444-DUMP to talk to a real person and get a quick quote. 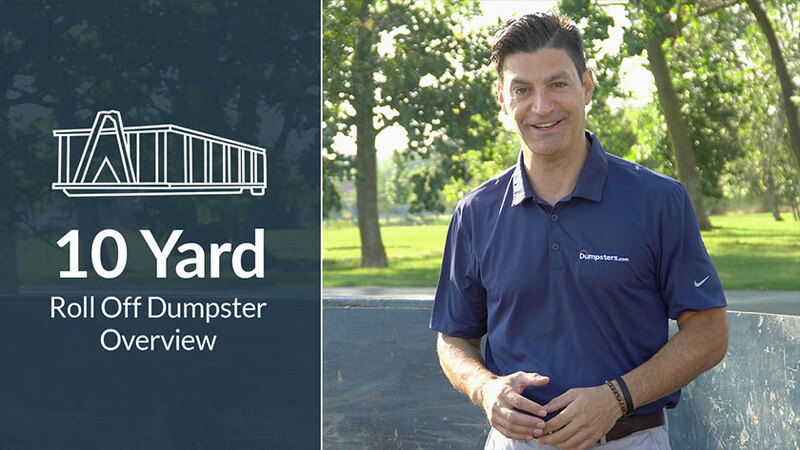 Is a 10 Cubic Yard Dumpster Right for Your Project? Removing flooring from a living room. Removing junk from a one car garage. Repairing a section of a driveway. Not Sure a 10 Yard Container Is Right for You? If you don't think a 10 yard roll off dumpster is the best fit for your project, we have other size options. Use our [weight calculators](https://www.dumpsters.com/resources/dumpster-weight-calculator) to estimate how much debris you have, or just give us a call at 844-444-DUMP. 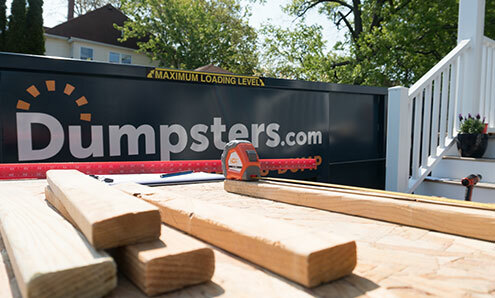 Our team is trained to help you choose the best dumpster size based on your project. 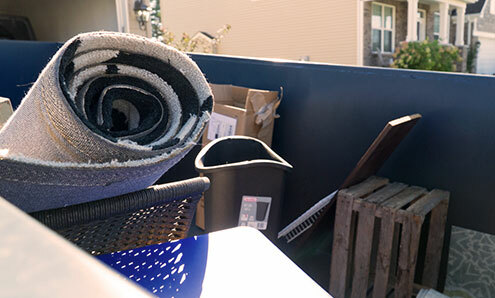 All our dumpsters include disposal costs up to a specified weight as a part of our all-inclusive pricing, so you’ll know the full cost of your order upfront. Please note that if you go over the covered weight, there is a pro-rated charge for each extra ton. Clear a spot where you'd like your dumpster placed. Remember that you'll need a permit from the city to have the dumpster placed on the street. The truck will require about 60 feet of space to approach and about 23 feet of vertical clearance to raise and place the dumpster.